This is my husband’s all-time favorite dish! 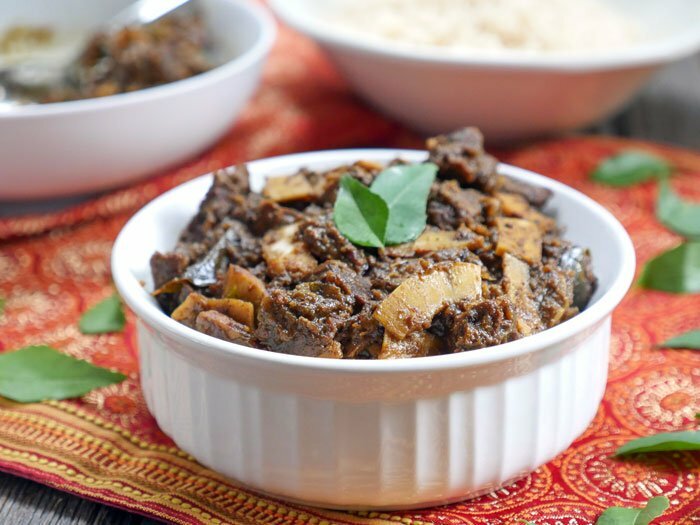 It’s a south Indian recipe that he grew up eating called “Kerala Beef Fry.” It’s basically a dry beef dish that happens to be insanely flavorful. In the past, this has been more of a special occasion dish – because it takes time and requires the use of several pots. BUT since I have successfully adapted the recipe so that it can all be made in a single pot – this will be on the menu way more often! You can make this dish from start to finish all in your Instant Pot (electronic pressure cooker). A lot of people aren’t very familiar with Indian beef recipes. Beef is a protein that you’ll be hard-pressed to find in an Indian restaurant. I’m north Indian and until I met Roby, I didn’t even realize there were Indians who ate beef! I still remember my first time tasting “Indian beef.” It was when Roby brought his mom’s beef cutlets with him to college (and I of course ate most of them). Until that point, my only experience with beef was in hamburgers or steaks. I had no idea that beef could be so delicious. 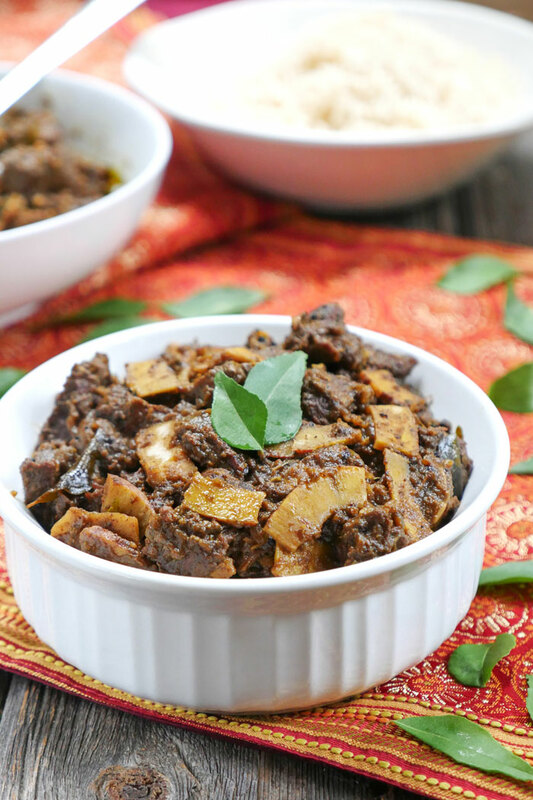 This recipe is a Christian Keralite dish called Erachi Ularthiyathu which translates to: beef fry. For Christians in India, especially in Kerala, beef is a staple and this particular recipe is considered a special dish by many – for good reason. The tender, spiced bites of beef are absolutely delicious. The dish is made with coconut slices and curry leaves (you can find both at any Indian grocery store) and it’s also fairly spicy. My recipe is relatively mild compared to what Roby is used to eating, but you can obviously adjust the heat to your liking. If it were up to Roby, he’d add ten serranos/green chilies to this… we compromise by using 2 ;). If you like Indian food and beef – then you will 100 percent love this recipe. I can’t wait to hear what you think!! And for those of you who use an old school whistling pressure cooker, here’s my original recipe from several years ago – with updated pictures. Seriously though, get yourself an Instant Pot! Press the sauté button and add 2 tablespoons of coconut oil and mustard seeds to the pot. Once the seeds begin to splutter, add the onions, Serrano peppers and curry leaves. Stir-fry for 15 minutes or until the onions turn brown. Add the garlic, ginger and spices. Stir-fry for 30 seconds, then add the beef, coconut slices and lemon juice. Stir-fry for 5-6 minutes to brown the beef on all sides. When you open the lid, you will see that the meat has naturally released quite a bit of liquid into the pot. Press the sauté button and cook for 15-18 minutes, adding the remaining 1 tablespoon of coconut oil at about the halfway mark. Stir-fry the beef until it is mostly dry, coated in masala and dark brown. This is meant to be a dry dish, so once it’s done cooking – while you can certainly eat it as a stew – I suggest using the sauté button to boil off some of the liquid. OMG – so good! A real winner. When I read it was your husband’s favorite recipe, I knew it would be great. Somewhat spicy for sure but luckily even our 7 year old son loves spicy and it was a big hit. Very authentic. Thanks for the recipe. So, this looked so amazingly alluring that I ordered the instapot just for this recipe. I followed the recipe to every detail and by the time I was done boiling down the copious amount of liquid which was generated, the beef stew meat was decimated to a pulp. It did not look chunky like the picture above. But the flavor was amazing so I am still holding out hope that perhaps I can get the appropriate texture by reducing the time of pressure cooking. Any suggestions? DB, I’m glad you liked the flavor! As for the meat, maybe the cut was too tender? I use grassfed stew meat… maybe when you make this again, remove some of the beef pieces, reduce the liquid then try adding the beef back in? Let me know how it goes! 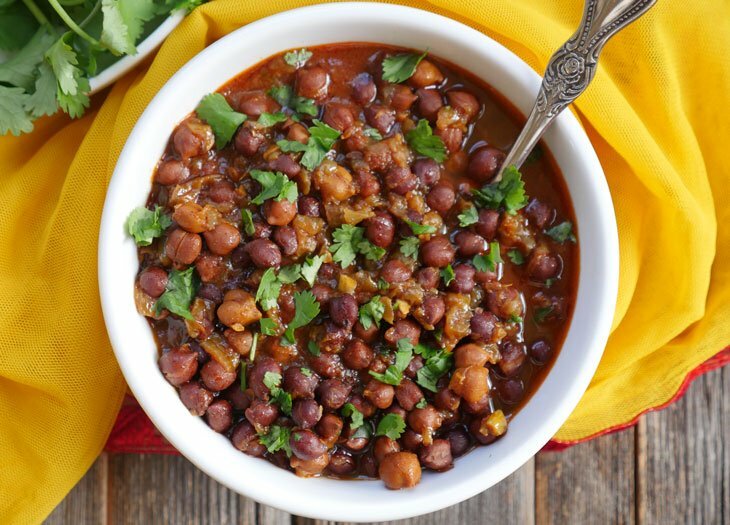 As a Malu who’s mom used to make this ever week (not in an instant pot) I can say the flavor of the masala is on point. However the beef is too stringy. I cooked it for 35 minutes and put fast release and it was still over cooked. I used a cut with a higher collegen content like rump roast hoping it wouldn’t be. I usually try to make something at least 10 times with tiny tweeks to get it just right. I think I will try brisket with maybe 25 minutes next time and see how it goes. Let us know if anyone else has tried any successful variations. So grateful to actually find your blog.. 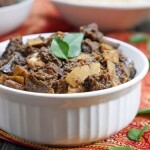 Need more Mallu Instant pot recipes..
Glad you found my blog too! 🙂 If you have any special requests, let me know! Have you ever tried Kappa-irachi? (Tapioca and beef cooked together). If you could make that into a crockpot or instant pot recipe, would be awesome. Yes! This is definitely on my list of things to try and make in an IP! I made the meat masala a week ago and I have been dying to try this recipe for a while but always happen to be missing an ingredient or two! Today I bit the bullet and decided to go for it with a couple of amendments. I halved the quantities as I used 1lb of diced lamb instead of 2lb of beef. I also ran out of coconut oil (d’oh!) so I used groundnut oil. The frozen coconut flesh I bought was grated and it dispersed and disappeared into the masala but gave it a beautiful flavour. I’m also a chilli fan so used extra hot red chilli powder and 3 serrano chillis. This recipe is actually amazeballs. I don’t have an instantpot, I made the whole thing in my wok and turned the heat up and down on my electric hob as necessary. For the meat/stew option I just put the cooker on its lowest heat setting, popped the lid on and plugged the steam hole with a little kitchen paper. worked a charm! When I was at university I had a sri lankan flatmate who would make this incredible dry mutton curry and I could never replicate it, and It drove me absolutely nuts for a while- this curry is the closest I’ve ever gotten to it and I’d even go as far as to say it might even be better! Thanks so much for sharing! Are you supposed to add the minced onion and sliced onion at the beginning together? I noticed in the original recipe you used the sliced onion for tadka at the end. Thanks! Hi Sonia! I add both together to keep things easier in this version – and honestly, it doesn’t make much of a difference when it comes to the final outcome of the dish. Let me know what you think of the recipe! Recipe loooks amazing, is it ok to cook without the cup of water needed as a minimum or is that just me following pressure cooker guidelines??? Hi Penny, I made this without adding extra water because meat naturally releases water. If that makes you uncomfortable then you can add water but just be sure to hit the saute button at the end to boil off extra liquid. This is simply amazing. So much flavor in a one-pot recipe. I love how you have taken recipes from your and your husband’s childhood and made them so accessible to the rest of us! Thank you! 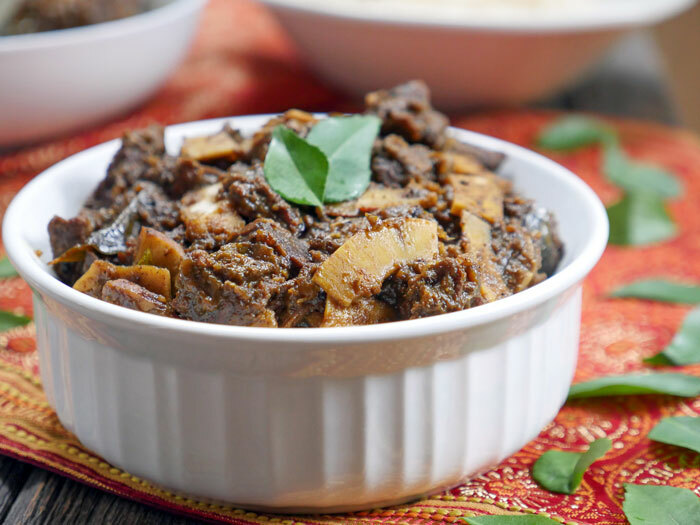 So happy to find a Kerala beef dish for the Instant Pot! Yay!! Now I can justify a purchase. Just stumbled on this so now I’ll have to try some other things. Suggestion: I wonder if it would work to put some yucca in the top…and then mash all of that together. For Kappa Biriyani. I can’t wait to hear what you think of my recipe once you make it in your new Instant Pot lol! And love the suggestion – will try it the next time I make this. I’m sure it’ll work! Ashley! I made this last night for my mother in law and sister in law (as you know they’re both from Kerala too!) and Jason and everyone LOVED it! My first time making Indian food and it was such a piece of cake thanks to your easy directions. I can see this being repeated in my house pretty often 🙂 Thanks for the recipe! Thank you so much for this recipe! 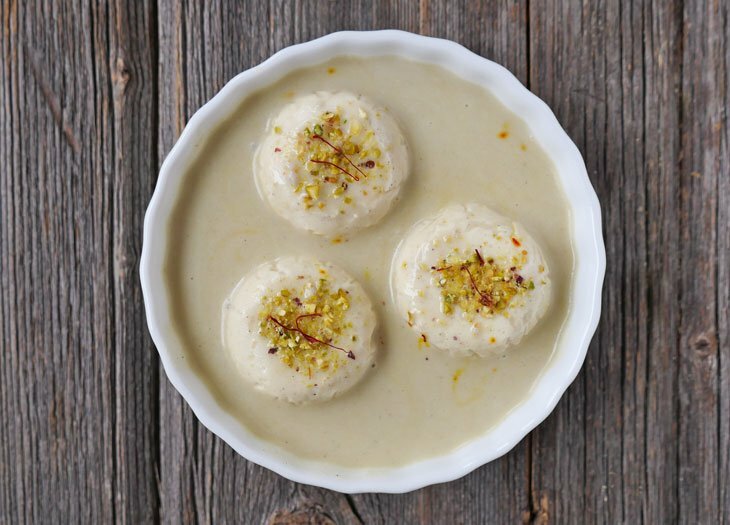 It’s as authentic as you would find in any Mallu home! I actually made it with lamb and it worked perfectly. My meat loving Mallu hubby is so happy that I have found this easy recipe and therefore will be making it more often! Kids and hubby licked their plates clean! I don’t eat meat, but when I saw their reaction, I almost wished I did!! Thank you so much!!! Vinita, this comment made my night! I’m so happy to hear that your kids and hubby liked the recipe so much! Did you really mean 1/4 cup of both ginger and garlic? Is it that much because of the instant pot? Thanks! 1/4 c doesn’t sound like much to me. There’s no such thing as too much garlic, too much ginger, or too much onion! And while we’e at it, no such thing as too much chocolate either! someone posted your blog in a paleo group , i am so glad that they did. and double happy to find a beef recipe from my state ! I’m so glad they did too! Happy to have you here 🙂 Let me know what you think of the beef! Absolutely love this recipe. My Malayali husband and son thought it was amazing. Since I made it in the evening, the fragrance after it came out of the cooker was too tempting, so they ate it with Matta rice and the next day I fried it and served with Parathas. They were even more pleased! It reminded me of my mother-in- law’s recipe. 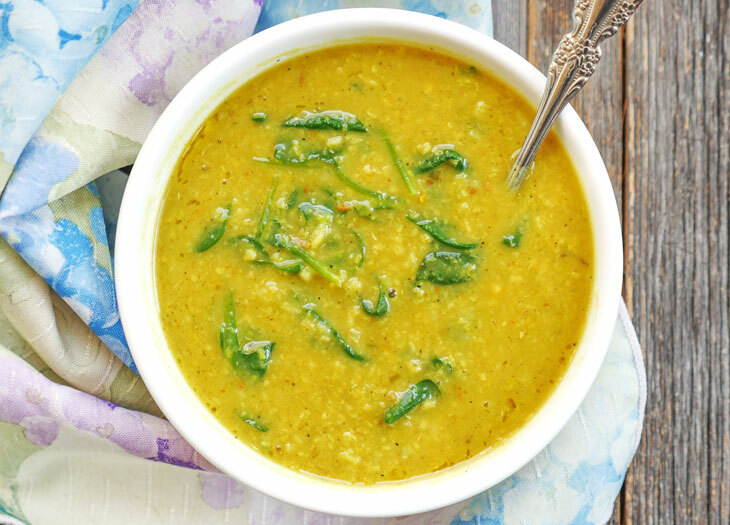 I loved the Instant Pot adaptation from the original recipe that I had. It made it so much easier. Thank you so much! Shelley, that’s so great to hear! Thank you so much for letting me know how it turned out for you and your family! This recipe is amazing! It is the best home made Indian food I have ever made. The results were restaurant quality. I was skeptical about not adding liquid and it turned out perfectly. This is definitely going I be a favourite around my place! Ashley, some supermarkets use Chuck, some Round, and, rarely, some sirloin for stew meat. I don’t like he fall-apart stringiness of chuck, but round is often as dry as cardboard……when sirloin is on sale, or Prime Round Roast, I’ll cube or slice it myself and get nice tender meat that isn’t stringy or dry. What kind, specifically, do you use? i want to make your mango chicken and my husband bought canned mangos. Is that ok.?? Hi Sandi, I mention in the blog post that canned mango is typically heavily sweetened which is why I suggest using fresh or frozen mango that you puree yourself. If you look for canned, try to go for unsweetened. Hope that helps! How long did it take to naturally release? There’s only one meat eater in my household. will this freeze?